Causes to Diabetic Feet Pain and turning Purple Blue? 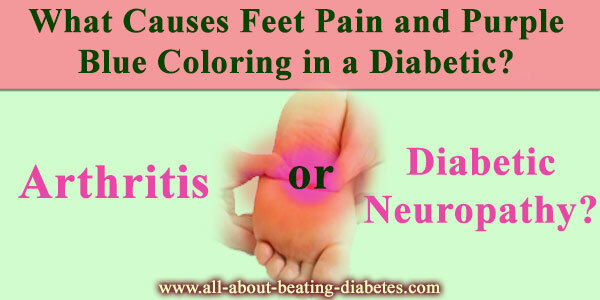 What Causes Feet Pain and Purple Blue Coloring in a Diabetic? Today I wanted to share the history of one of my patients asking guidance over the pain and changing in color of his legs. This patient was a type 2 diabetic for long time (over 10 years) and on medications (Metformin, and insulin shots at bedtime). He was overweight with belly fat. Recently, he is experiencing pain in his feet, particularly located around the ankles. He is also noticing that his feet turn purple and sometimes get dark in color. He is telling that has performed several Doppler ultra sounds on his legs with the final result as “Normal”. I may understand that each of you has his/her own history. However, sharing and/or reading to other’s history would help you understand better your current situation and/or to take proper actions for further future steps. As the ankle of this patient has shown to be swollen, the very first thought is directed to arthritis. During the arthritis attack, patients do feel pain and swelling of the joints. At this point, it is good to do the erythrocyte sedimentation rate (ESR) testing together with measuring the levels of C-reactive protein (CRP), antistreptolysin and rheumatoid factor and fibrinogen levels. All these tests are good enough to determine the presence of inflammation, its current degree and if it has to do with inflammation. Another explanation could be because of diabetes, especially when not controlled well. As it can damage the nerves, the patient might experience pain in the feet and legs. Furthermore, when the damages are so severe, it is difficult to feel pain while hurting or any injury or trauma or giving problems to feet nerve supply. This is physically shown with changes in the color of the skin such as turning purple to blue. To evaluate the functioning of the muscles, the patient is advised to do the physical examination by the physician. During such exam, the doctor will evaluate the strength and the tone of the muscles (legs, feet, arms), tendon reflexes, and the sensitivity of the skin to vibration, temperature and touch. In addition, to evaluate the functioning of the nerves, the patient is also advised to perform conduction, electromyography (EMG), filament test or others as suggested by the neurologist. How can a diabetic resolve pain in the legs and changes in the skin color? The very first thing to do is to try to optimize blood sugar levels. Apart taking the medications, lifestyle and diet changes can help a lot. Next, losing weight is also important to control diabetes and to relieve the complications. Taking insulin is another factor causing being overweight, however, its use is very important in controlling your disease. At the moment, you cannot change the therapy but can exercise and keep a healthy diet and lifestyle regime. 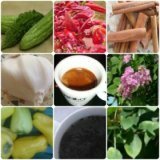 You can use the mixture of herbs that work for diabetes and improves blood circulation; you can search at the local herbal stores or can ask for supplements containing the extract of those herbs. Taking proper hygiene for the feet and keeping them in movement can help relieve the symptoms too. Meanwhile, applying warm and cold compresses to the swollen ankles can help relieving the swelling together with the use of anti-inflammatory drugs such as ibuprofen, ketoprofen, naproxen, etc. This is all I wanted to share with you today! Thank you for following!